MotoGP world championship leader and current Ducati rider Casey Stoner is poised to begin talks with Ducati bosses about a long-term contract which will keep him with the Bologna factory until the end of 2010. 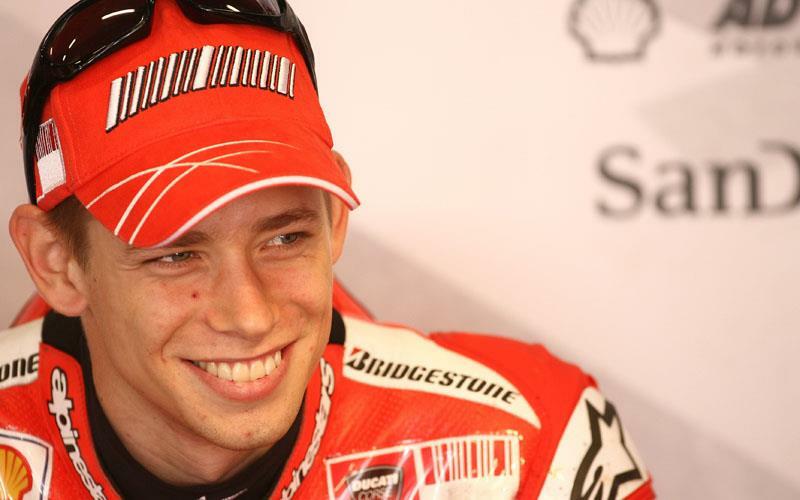 Stoner has already agreed a 2008 deal with Ducati in MotoGP, with an option on him that expires in September exercised well in advance following his outstanding form this season. The 21-year-old has won four out of seven races this season to lead the MotoGP world championship by 14-points going into the British GP at Donington Park on June 24, 2007. And the Australian will enter discussions later this year about a contract extension for MotoGP that will keep him on a factory Ducati GP7 800 machine for the next three years at least. His father Colin Stoner, who conducts all of Stoner’s off-track affairs, told MCN: “Casey will definitely be renewing with Ducati for next year, that’s no problem. “We are talking to Ducati about the future already and I envisage that by the end of this season we will have something concrete for 2009 and 2010. At the moment we’ve just agreed on which way we are going to go because Ducati already had an option on Casey next year in the current contract. “Both parties are happy to continue. The option will happen early, it was due in September, we have to formalise it soon and make an announcement. Ducati wants Stoner locked into a long-term deal as soon as possible. His performances in 2007 have seen him confirm his reputation as one of the hottest young talents in MotoGP and world racing. Stoner has made it clear that he wants to commit to Ducati beyond the 2008 season, and Colin Stoner added: “It’s a long term view but Casey doesn’t want to go anywhere else. “It seems long term when you talk another three years but Casey will still only be 24 in three years. He’s so happy with the team and people he doesn’t see the need to have confusion about what he is doing the following year.